Wailuku filmmaker Writer/Director Brian Kohne tells us his feature film “Kuleana” is ready for release, and will be shared with the public for the first time before a home audience at the 18th Annual Maui Film Festival, which runs from Wednesday, June 21 through Sunday, June 25, 2017. The film, from Maui filmmakers Brian Kohne, Writer/Director, and Stefan Schaefer, Producer, has been selected to kick off a special Hawaiʻi Filmmakers Showcase at the world renowned open air Celestial Cinema in Wailea at 8 p.m. on Friday, June 23, 2017, as the first film in what will be a three film triple header. The announcement comes after more than a decade of work, with Kohne beginning his first written draft in 2005. “It originated 12 years ago. I was back home, and had no intention of returning home to stay,” said Kohne who said he had always wanted to return to Maui to live, but it was never the right time. “While I was on Maui, I started waking up in the middle of the night with this flood of stories. So I’d get up and I’d write it down, and I didn’t know where it was coming from. Then the next day, I’d read it, and it was very unusual,” he said. “It’s things that I didn’t know; subjects that I hadn’t considered. It was clearly, deeply cultural, in a way that I couldn’t have, myself, been responsible for,” said Kohne. The story essentially led him back home to Maui. “I feel I was being not asked, but I was being told to take this on,” said Kohne. Eleven drafts and 12 years later, Kohne is ready to share the film with the world. “You only get one chance to tell a story like this, and if you’re going to work with something like kuleana, you’ve got to put your best foot forward,” said Kohne. 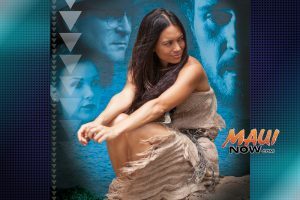 Kuleana stars Kristina Anapau, Moroni Kanekoa, Sonya Balmores and features Augie T, Branscombe Richmond and Kainoa Horcajo in supporting roles. It has a list of some 150 actors and actresses, primarily Maui residents. While three of the leads were brought in from California, Kohne explains they are originally from Hawaiʻi, and everyone cast in the film is either from here or is a resident. When asked about the benefits and disadvantages of producing a film entirely in the Hawaiian Islands, Kohne responded saying, one of the tricks of the local filmmaker is to figure out what those advantages are and leverage them. “In our case it’s the overwhelming support we received from our community. If we were simply a production from out of state coming to produce a film like this on Maui, we’d generally have to pay for locations and all products and services, so the budget would be really big. We were able to use our local connections to move mountains and make miracles and make a really big film for a very responsible budget. The film, whose title explores the topic: “Protect Our Family, Defend This Land,” is a concept that has been attempted in the past by mainland based filmmakers, but being a completely Hawaiʻi-based film, Kohne says, makes a world of difference. “I think that we’ve been working at it for long enough now, where there’s a lot of people that worked on Kuleana not only behind the camera, but in front of the camera, that are starting to become more comfortable with finding that sweet spot where maybe it’s still universal, but it’s still uniquely us,” said Kohne. The film, as Kohne explains, is based on Maui in 1971. “It’s about a disabled Vietnam vet who must rediscover the Hawaiian warrior within in order to protect his family, defend their land, and clear his father’s name. He finds himself a suspect in a murder case. So it’s sort of a tropical nior,” said Kohne. “He was trying to pass that down to his family and make sure they understood not just the importance of the culture, and the importance of where they came from, but why that should be central to who they are and influence what they do in this life,” said Horcajo. The other two features showing with “Kuleana” will be reveals over the coming weeks by the Maui Film Festival along with the more than thirty additional feature films and shorts that will round out the festival’s 2017 Film Program. Rivers founded the Maui Film Festival  in 2000 as a festival committed to the celebration and exploration of cinema at the intersection of smart and heart. The Festival’s mission is to share exceptional cinematic vision in the service of compassionate and transformative storytelling with a diverse audience who both call Maui their home and their home away from home. Since its inception, the Maui Film Festival has screened more than 700 narrative and documentary feature length and short films from around the world to a diverse audience of industry luminaries, filmmakers, cineastes and movie lovers of all ages. Over the last 17 years the festival has been fortunate to honor such talents as Viola Davis, Bryan Cranston, Elizabeth Banks, Jessica Chastain, Claire Danes, Laura Dern, Zooey Deschanel, Adam Driver, Clint Eastwood, Scott Eastwood, Zac Efron, Colin Farrell, Andrew Garfield, Jake Gyllenhaal, Woody Harrelson, Garrett Hedlund, Brie Larson, James Marsden, Mike Myers, Lupita Nyong’o, Emma Roberts, Owen Wilson, Olivia Wilde, and Evan Rachel Wood, among many others.